If you’re anything like me you have a subscription to 3-4 different music gear stores (online) that send you updates every week/month or whatever. Most of the time the updates they send are notifications of slashed prices or promotion deals. I love looking at new gear that is released or soon to be released, and yes sometimes I have gear lust. I constantly have to remind myself of what I actually need and use in my studio (doesn’t always work out). Sometimes upgrades are worth it especially if they enable you to create music faster and more efficiently. 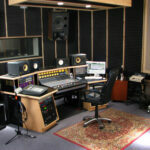 While you’re upgrading your studio, be sure to focus on the essential needs rather than spending recklessly. Most of us music producers/composers do a lot of recording at night in our own homes, while are family is asleep. With that said, you’ll need a pair of headphones that are both quality and comfortable to wear for long periods of time, and do not create ear fatigue. The 2 headphone models that immediately flash in my mind would be the Beyerdynamic DT770 PRO or the Sennheiser HD650’s. Both models feel good and have great sound quality. There are other good headphones on the market, but I mention these 2 because I have a lot of experience with them. A must for professional recording! There are dynamic mics out there that sound great such as the SM58, but the truth is not everything sounds good on that mic. I’d go with a condenser mic because they allow you to pick up more characteristics in sound and they’re reasonably priced these days. You can pick up a quality condenser for as little as $200.00. Condenser mics are great for recording: Vocals, Instruments, Foley Recording etc. No studio should be left without one. Blue Spark: Fancy look, made by a great company and it’s a jack of all trades. It’s clarity is amazing. Normally this mic is $199, they recent dropped the price to $149 on amazon. SCM 900: Nady doesn’t get to good a rep in the industry, but for what they’re asking $70.00 it’s worth having in your arsenal even if it’s used as a backup mic. I find it great for guitars, male vocals and edgy sounds. I know you’re probably thinking “A mic stand is a mic stand, if it holds the mic then it’s good enough“. I remember I was building a recording setup for a friend of mine, and all he wanted to do was record vocals. Well, he purchased a Blue Baby Bottle Condenser Mic (very nice IMO) and placed it on a cheap $30.00 mic stand w/boom adapter. The mic stand was a little shaky, and held the mic fine in an upright position, but as soon as he adjusted the arm on the boom the weight of the Baby Bottle pulled the whole stand down and smashed on the floor (destroying his mic). Granted, you have to stick with your budget, but if you’re not going to get a quality stand, pay close attention to how much weight that arm can hold. A decent mic stand (like the one my friend had) will run you $20-$30. A good mic stand w/boom adapter is going to run anywhere from $60-$100. There’s not that much of a gap there. Speed the extra money and get something quality. Most of you will purchase a good condenser mic and some basic cables. There is nothing wrong with this, but more often than not cheaper cables (unless they are on sale) are more likely to give you unwanted buzzing and feedback in your recordings. To avoid this, set aside a decent budget and stick with high quality cables with good connectors. Stick with brands such as: Monster, Pro Co, Blue and Mogami – Hosa (snakes) are good for patching. I also have emergency drives. You never know what may happen. I know this might seem like a lot of money, but it would be more expensive replacing everything you’ve lost, especially if you lost work of your clients. Losing client’s work can result in lawsuits.